OpenVox A400P delivers great voice quality in the telephony systems. With interchangeable FXS/FXO modules, it can eliminate the requirement for separate channel banks or access gateways. The A400P contains 4 module banks. Each bank supports one analog interface. The module banks may be filled with up to 4 FXO or FXS modules enabling the creation of any combination of ports. Scaling of an analog card solution is accomplished by simply adding additional cards. A400P works with Asterisk®, Elastix®, FreeSWITCH™, PBX in a Flash, trixbox®, Yate™ and IPPBX/IVR projects as well as other Open Source and proprietary PBX, Switch, IVR, and VoIP gateway applications. 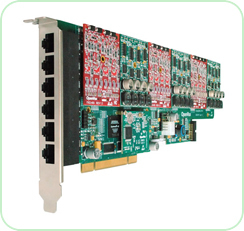 AE2410P is a new generation analog card with Octasic® Hardware Echo Cancellation Module on board. With the interchangeable quad-FXS and quad-FXO modules, AE2410P can eliminate the requirement for separate channel banks or access gateways. Once the Octasic® DSP module EC2032 is added to the AE2410P, please make sure you are ready to say goodbye to the poor voice quality and echo echo echo in your phone system. No one will even get a chance to hear that any more! The AE2410P with Octasic DSP module will support Telco-grade hardware echo cancellation on all channels, up to the card’s maximum configuration in 24 ports with no additional CPU load. AE2410P works with Asterisk®, Elastix®, FreeSWITCH™, PBX in a Flash, trixbox®, Yate™ and IPPBX/IVR projects as well as other Open Source and proprietary PBX, Switch, IVR, and VoIP gateway applications. 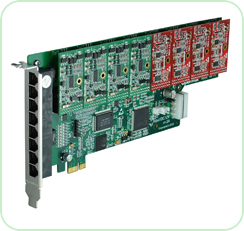 FXOS200 is a Dual-channel module, which builds one FXO and one FXS channel with failover capability. When PBX system is down, PSTN line connecting FXO will automatically switch to analog phone connecting with FXS. OpenVox A400E delivers great voice quality in the telephony systems. With interchangeable FXS/FXO modules, it can eliminate the requirement for separate channel banks or access gateways. The A400E contains 4 module banks. Each bank supports one analog interface. The module banks may be filled with up to 4 FXO or FXS modules enabling the creation of any combination of ports. Scaling of an analog card solution is accomplished by simply adding additional cards. A400E works with Asterisk®, Elastix®, FreeSWITCH™, PBX in a Flash, trixbox®, Yate™ and IPPBX/IVR projects as well as other Open Source and proprietary PBX, Switch, IVR, and VoIP gateway applications. OpenVox A800E delivers great voice quality in the telephony systems. With interchangeable FXS/FXO modules, it can eliminate the requirement for separate channel banks or access gateways. The A800E contains 8 module banks. Each bank supports one analog interface. The module banks may be filled with up to 8 FXO or FXS modules enabling the creation of any combination of ports. Scaling of an analog card solution is accomplished by simply adding additional cards. A800E works with Asterisk®, Elastix®, FreeSWITCH™, PBX in a Flash, trixbox®, Yate™ and IPPBX/IVR projects as well as other Open Source and proprietary PBX, Switch, IVR, and VoIP gateway applications. 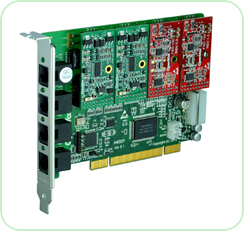 The FXO100 FXO module allows OpenVox analog A400/A800/A1200 Series cards to terminate analog telephone lines (POTS). Because of the modular design, users can activate additional ports at any time with more FXO100 or FXS100 modules. The FXO100 module passes all the call features any standard analog telephone line will support. 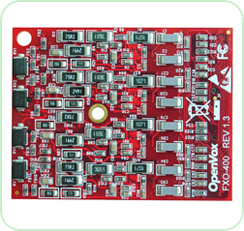 The FXS100 FXS module allows OpenVox analog A400/A800/A1200 Series cards to terminate analog telephones. Because of the modular design, users can activate additional ports at any time with more FXS100 or FXO100 modules. The FXS100 module passes all the call features any standard analog telephone will support. OpenVox A400M delivers great voice quality in the telephony systems. With interchangeable FXS/FXO modules, it can eliminate the requirement for separate channel banks or access gateways. The A400M consists of two parts: the A400MM and the A400MS. The A400MM connects Mini PCI slot while the A400MS installs FXS/FXO modules. The A400MS contains 4 module banks. Each bank supports one analog interface. The module banks may be filled with up to 4 FXO or FXS modules enabling the creation of any combination of ports. Scaling of an analog card solution is accomplished by simply adding additional cards. A400M works with Asterisk®, Askozia®, Elastix®, FreeSWITCH™, PBX in a Flash, trixbox®, Yate™ and IPPBX/IVR projects as well as other Open Source and proprietary PBX, Switch, IVR, and VoIP gateway applications. OpenVox A800P delivers great voice quality in the telephony systems. With interchangeable FXS/FXO modules, it can eliminate the requirement for separate channel banks or access gateways. The A800P contains 8 module banks. Each bank supports one analog interface. The module banks may be filled with up to 8 FXO or FXS modules enabling the creation of any combination of ports. Scaling of an analog card solution is accomplished by simply adding additional cards. 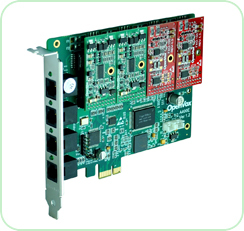 The FXO400 Quad-FXO module allows OpenVox Analog A2410P/AE2410P series cards to terminate four analog telephone lines (POTS) per module. Because of the modular design, users can activate additional ports at any time with more FXS400 or FXO400 modules. 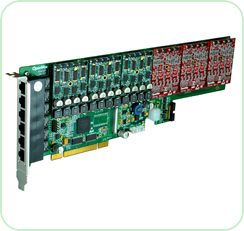 The FXO400 module passes all the call features any standard analog telephone line will support. 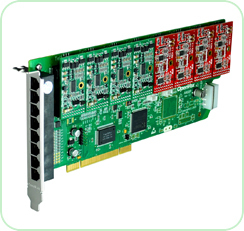 The FXS400 Quad-FXS module allows OpenVox Analog A2410P/AE2410P series cards to terminate four analog telephones per module. Because of the modular design, users can activate additional ports at any time with more FXS400 or FXO400 modules. The FXS400 module passes all the call features any standard analog telephone line will support.